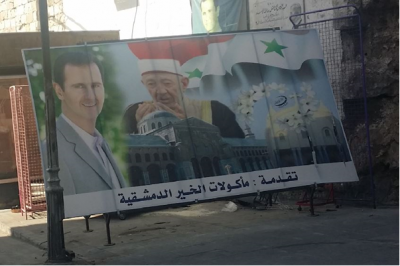 A billboard in Damascus shows President Assad and the late Sheikh al Bouti, who was Syria’s senior Quranic scholar. The Sheikh was murdered in a mosque with 40 others by Jabhat al Nusra, in May 2013. In typical fashion they threatened to kill him, killed him, celebrated and then blamed the Syrian Government. War propaganda often demands the abandoning of ordinary reason and principle, and the Dirty War on Syria demonstrates this in abundance. A steady stream of atrocity stories – ‘barrel bombs’, chemical weapons, ‘industrial scale’ killings, dead babies – permeate the western news on Syria. These stories all have two things in common: they paint the Syrian President and the Syrian Army as monsters slaughtering civilians, including children; yet, when tracked back, all the stories come from utterly partisan sources. We are being deceived. Normal ethical notions of avoiding conflicts of interest, searching for independent evidence and disqualifying self-serving claims from belligerent parties have been ignored in much of the western debate. This toxic atmosphere invites further fabrications, repeated to credulous audiences, even when the lies used to justify previous invasions (e.g. of Iraq in 2003) and dirty wars (e.g. in Libya, 2011) are still relatively fresh in our minds. As in previous wars, the aim is to demonise the enemy, by use of repeated atrocity claims, and so mobilise popular support behind the war (Knightley 2001). These principles apply whether speaking of the nature of wartime violence, or of legitimacy matters such as public opinion and political allegiance. So, for example, when Islamist armed groups and their associates claim that their mortal enemy the Syrian Arab Army is slaughtering civilians (e.g. AP 2015), that claim by itself is next to meaningless. We expect armed opponents to attack each other, with words as well as weapons. False stories of Government atrocities were in play from the beginning of the conflict. The head of a monastery in Homs, Mother Agnes-Mariam, denounced ‘false flag’ crimes by ‘Free Syrian Army’ groups back in 2011, where the images of murder victims were recycled in media setups by sectarian Islamists (SANA 2011). Similarly, US journalist Nir Rosen wrote of ‘dead opposition fighters … described as innocent civilians killed by security forces’ (Rosen 2012). What is the lesson here? Beware of partisan atrocity stories. They might at best serve as a flag, an accusation which might set in train a search for independent evidence; but they are more often a distraction from present reality. For the same reason, when the Qatari monarchy (which has invested billions of dollars in the armed attacks on Syria) presents an anonymous, paid witness ‘Caesar’, with photos of numerous dead and tortured bodies, blaming the Syrian Army for ‘industrial scale killing’ (O’Toole 2014; Jalabi 2015), it should be plain that this ‘evidence’ is partisan and unreliable (Smith-Spark 2014; MMM 2014). The fact that this story was presented by a belligerent party just before a Geneva peace conference should give further cause for suspicion. But without genuinely independent evidence to corroborate the witness we have no way of verifying in which year, circumstance or even which country the photos were taken. Those who finance and arm the sectarian groups have slaughtered hundreds of thousands in recent years, in the wars in Afghanistan, Iraq and Syria. There is no shortage of photos of dead bodies. The fact that western media sources run these accusations, using lawyers (also paid by Qatar) to provide ‘bootstrap’ support (Cartalucci 2014; Murphy 2014), merely shows their limited understanding of independent evidence. Similar principles apply to claims over legitimacy. Assertions by US Government officials, openly and illegally pursuing ‘regime change’ in Syria, that President Assad has ‘lost all legitimacy’ (e.g. Hilary Clinton in Al Jazeera 2011) should be seen as simply self-serving, partisan propaganda. In the case of Washington’s claims about the August 2013 chemical weapons attack in East Ghouta, the US Government and some of its embedded agencies attempted to use telemetry and some other circumstantial evidence to implicate the Syrian Army (Gladstone and Chivers 2013; HRW 2013). However, after those claims were destroyed by a range of independent evidence (Lloyd and Postol 2014; Hersh 2014; Anderson 2015), Washington and its media periphery simply kept repeating the same discredited accusations. In the climate of war, very few in the western media were bold enough to say that ‘the emperor has no clothes’. Perhaps the most common, systematic error of the western media, reporting on the Syrian crisis, has been the extraordinary reliance on a single person, a man based in Britain who calls himself the Syrian Observatory for Human Rights (SOHR). Many of the stories about Syrian body counts, ‘regime’ atrocities and huge collateral damage come from this man. 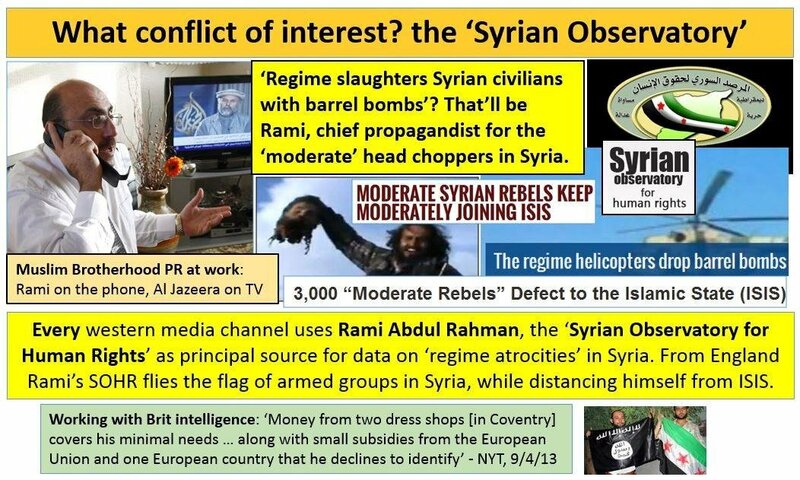 Yet Rami Abdul Rahman has always flown the flag of the Muslim Brotherhood led ‘Free Syrian Army’ on his website (SOHR 2015). He claims to collect information from a network of associates in and around Syria. It is logical to assume these would also be mostly anti-Government people. Media channels which choose to rely on such an openly partisan source undermine their own credibility. Perhaps they don’t care? The fact that western governments, in this conflict, generally support the Muslim Brotherhood line on Syria may make them less concerned. Western media regularly presents the SOHR stories, often with impressive-sounding casualty numbers, as though they were fact (e.g. AP 2015; Pollard 2015). A ‘regime’ denial may be added at paragraph 7 or 8, to give the impression of balanced journalism. Abdul Rahman’s occasional criticism of rival Salafist groups (such as DAESH-ISIL) perhaps adds a semblance of credibility. In any case, the unthinking adoption of these partisan reports has been important in keeping alive the western myth that the Syrian Army does little more than target and kill civilians. Much the same problem can be seen in the 2014-2015 campaign over ‘barrel bombs’, where it has been said that a particular type of Syrian Air Force bomb, which includes fuel and shrapnel, has been responsible for massive civilian casualties. Robert Parry (2015) makes the point that any sort of improvised bomb ‘dropped from helicopters’ would most likely be far less indiscriminate than most missile attacks, not to speak of the depleted uranium, napalm, white phosphorous and cluster munitions regularly used by Washington. However the point here is not to do with the technology, it is simply a new way to generate horror and backing for the war, by claiming that the Syrian Army only ever kills civilians. The supposedly ‘indiscriminate’ nature of this ‘new’ weapon is merely suggested by repetition of the slogan. The great majority of sites of these alleged ‘barrel bomb’ attacks, over 2014-2015, have been places occupied for years by sectarian Islamist gangs: north-eastern Aleppo, Douma in north-eastern Damascus and Raqqa in the eastern desert. The US-based group Human Rights Watch (tightly linked to the US foreign policy body, the Council on Foreign Relations) published a map showing the sites of literally hundreds of these barrel bomb attacks in ‘opposition held’ north-east Aleppo (HRW 2014). The ‘opposition’ in these areas has been the official al Qaeda franchise in Syria, Jabhat al Nusra, allied with the Saudi-backed Islamic Front (a merger of former Free Syrian Army groups Harakat Ahrar as-Sham, Suqur as-Sham, Liwa at-Tawhid, Jaysh al-Islam, Jabhat al-Kurdiyya, Liwa al-Haqq and Ahrar as-Sham), then later the ‘Islamic State of Iraq and the Levant’ (ISIL), the Turkistan Islamic Party and the Army of Conquest. Virtually all these groups are terrorist organisations responsible for multiple atrocities in Syria. It is hardly surprising, then, that the Syrian Army regularly bombs them. Contrary to the myth of the ‘moderate rebel’, the terrorist groups most often work together. For example, a top US-backed leader of the Free Syrian Army (FSA), Abdel Jabbar el-Okaidi, was quite open about the fact that he worked closely with ISIL-Daesh (see Eretz Zen 2014). The FSA has worked closely with the other main al Qaeda group, Jabhat al Nusra, from the beginning. The source of the ‘civilian’ death claims comes almost exclusively from the Islamist groups themselves, or ‘activists’ embedded with them. Those claims are then magnified by the western media and by some human rights NGOs which are effectively ‘embedded’ with western governments’ foreign policies. Casualty numbers are typically provided by the British-based ‘Syrian Observatory on Human Rights’ (SOHR 2015), the British-based Syrian Network for Human Rights (SN4HR 2015), or the Istanbul-based Violation Documentation Center in Syria (VDC 2015; Masi 2015). All these centres are allied to the Islamist gangs, but usually maintain some public distance from ISIL. The VDC has listed some ISIL causalities in Syria as ‘martyrs’ for the revolution (see Sterling 2015b). However my main point is that they are all partisan voices, sectarian Islamists committed to overthrow of the secular state and highly motivated to vilify and lie about the Syrian Army. Commander in Chief of the propaganda war, US President Obama, leads the way, claiming his Syrian counterpart ‘drops barrel bombs to massacre innocent children’ (Obama in Mosendz 2015). As there has never been any evidence that President Assad had any such intent, Parry (2015) is right to call this statement ‘crude and deceptive propaganda’. The White House is backed up by ‘embedded watchdog’ Human Rights Watch, whose boss Kenneth Roth obsessively repeats the words ‘barrel bombs’, and has even been exposed posting photos of devastated Gaza and Kobane, falsely claiming that both showed Aleppo after ‘Assad’s barrel bombing’ (MOA 2015; Interventions Watch 2015). In fact those photos showed the results of Israeli, US and ISIL bombing. The recycling of war dead photos seems to have become routine. Yet the foundation of western war propaganda is the consistent reliance on partisan sources. The ‘barrel bomb’ campaign is clearly designed to delegitimise the Syrian Government and the Syrian Army, and also perhaps to deter or slow the attacks on Islamist groups. However the Syrian Army does not apologise to anyone for bombing terrorist held areas, and they have always made well-publicised efforts to evacuate civilians before doing so. Most civilians in the areas said to have been ‘barrel bombed’ left a very long time ago. In January 2015 Reuters (2015a) showed video of some of the last large evacuations of Douma (north-east Damascus) by the Syrian Army. Several months later the same agency decried a massacre of ‘civilians’ in Douma, using the ‘activists’ of the SOHR as their source (Reuters 2015b). Repetition of these fake claims by the armed groups and their associated ‘activists’ led to headlines like: ‘The Syrian Regime’s Barrel Bombs Kill More Civilians than ISIS and Al Qaeda Combined’ (Masi 2015). Such stories suggest the need for deeper war on Syria. The photos of dead and injured women and children in the ghost towns inhabited by the armed groups are simply borrowed from other contexts. Amnesty International (USA) largely adopted the barrel bomb story, along with the invented ‘civilian’ casualty numbers. Yet Amnesty shares that same weakness in method: relying on partisan sources like the VDC, the SN4HR and the SOHR. Amnesty’s pro-western bias has led it into repeating NATO-contrived falsehoods in other conflicts, such as in Kuwait and Libya (see Sterling 2015b). ‘Islamists [do] hide behind civilians. But if we really killed everyone who supported the enemy, the Douma district would have been destroyed long ago – simply levelled with tanks in a single day, like some [Syrian] hotheads have been [demanding] for a long time already. But Assad doesn’t want that … our task is to reunite the country. Therefore, before each mission, we were told that we should not shoot at civilians under any circumstances. If a civilian dies, there is always an investigation and, if necessary, a court-martial’ (Mizah 2015). Great care is also needed with the claims of outsiders who run opinion polls in Syria. For example, although the British-based ORB International is not a government agency, it is financed within a hostile state and engages with debates of concern to the belligerent parties. Case in point: its mid-2014 poll suggested that ‘Three in Five Syrians Support International Military Involvement’ (ORB 2014: Table 1). This proposal is an issue that only really preoccupies western governments and the figure is implausible. First of all, those Syrians who support the government (by most accounts a strong majority of the population) have always opposed foreign intervention. Second, most of the Syrian Opposition also opposes foreign intervention. The most comprehensive Syrian opposition document, the Damascus Declaration (2005), opposed both armed attacks on the government and foreign intervention. Only the Muslim Brotherhood, some exile figures and some of the Kurdish groups later split from this position. The suggestion that, after three years of war and tremendous suffering, which has already involved high levels of NATO and Gulf Monarchy intervention, 60% of Syrians want more of that sort of foreign intervention just does not sit with the known facts. It does fit with an unrepresentative poll which elevates the voices of those backing the armed groups. We need to look at the way ORB collects information. Their methods are opaque. The British group carries out polls in Syria by employing small numbers of Syrians with whom they communicate by phone and internet. These local agents are then trained to select and interview small groups of people across Syria. ORB provides little information on how they select their agents or on how those people, in turn, select their interviewees. They simply assert that their poll was representative. The mid-2014 poll claimed to have that found that 4% of Syrians said the [Saudi Arabia-backed Islamist group] ISIS/Daesh ‘best represented the interests and aspirations of the Syrian people’ (ORB 2014). ISIL was, by then, the most prominent armed anti-Government group. That result (4% support) could be plausible, and not inconsistent with other information. But its reliability is undermined by the implausibly high level of support for foreign military intervention. A further anomaly is that the ORB poll of July 2015 showed ISIL to be viewed positively by 21% of Syrians (ORB 2015: Table 3). Although this was not exactly the same question, the difference between these figures (4% and 21%) is huge and hardly explicable by anything that had occurred between 2014 and 2015. No-one else has suggested that the fanatics of ISIL-Daesh are anything close to that popular. The 35% ‘net positive view’ of the terrorist group Jabhat al Nusra (ORB 2015), notorious for its suicide truck bombings and beheadings is also implausible. Indeed, how could one third of any society view ‘positively’ foreign-led terrorist groups, best known for their atrocities? Something is very wrong here. The most reasonable explanation is that serious bias affects the ‘representativeness’ of selection for the ORB surveys. ORB was previously criticised by an academic paper for its opaque and ‘incomplete disclosure’ of method and ‘important irregularities’ in their estimates of deaths from the war in Iraq (Spagat and Dougherty 2010). That unreliability is also present in their Syrian data. Despite what seems like highly inflated support for the al Qaeda groups, the 2015 poll still shows President Assad as the most positively viewed force in the country, although at only 47% (ORB 2015: Table 3), a figure much lower than that of any other poll (Syrian or non-Syrian) during the crisis. Interestingly, the ORB 2015 poll says 82% of Syrians believe ISIL was created by the US (ORB 2015: Table 20). However given the other anomalies of the survey it is not possible to place any reliance on this figure. It seems plain that the ORB polls, through their mostly undisclosed selection processes, have given an enhanced voice to certain groups of anti-government people. That is perhaps not surprising, for a British company, and it may help reinforce popular discussion in western countries. However it does not help foreign understandings of Syria. While it is important to recognise the sources of bias, the repetition of anti-Syrian stories based on partisan sources cannot be a matter of simple bias. We know from independent evidence that earlier claims of massacres were fabricated by the sectarian groups, then backed by Washington. This has been documented with respect to mass killings at Houla, Aqrab, Daraya, and East Ghouta (see Chapters Eight and Nine). After these exposures, there were no apologies or admissions either from the White House or the western media channels which ran the initial stories. This pattern means that other false allegations are likely. While genuine students of the crisis must revert to principled study of claims and counter-claims, we should also recognise there is an industrial scale propaganda machine, likely to maintain production into the foreseeable future.